Guest blog entry by Matt Quirion. Every time I sign into Facebook I see, “How’s it going Matt?” Well, it’s going good. A year ago I would not have been able to say that. For much of the past few years I have been struggling with depression. Thankfully, I am doing much better as of late. I have done counseling and have been on medication. I am also blessed with very supportive family and friends. Recently I have been working as a volunteer for the Collateral Damage Project, an organization that started out locally and is devoted suicide awareness and prevention. There is a large amount of stigma that surrounds suicide and mental health issues in general, and often acts as a barrier to prevent people from getting help. One of the main goals of Collateral Damage is to try and break down this stigma and get people talking about these issues. 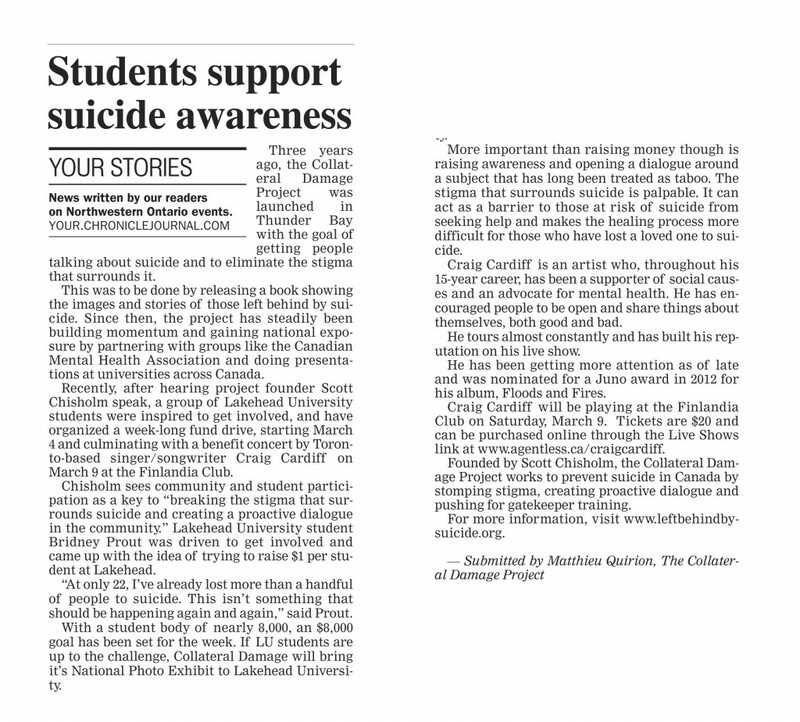 For the week of March 4th to the 10th Collateral Damage is partnering up with Lakehead University (Thunder Bay) student volunteers to put on some events and do fundraising and awareness work on Campus. Our goal is to raise 8000$, 1$ per student at Lakehead University. I am not normally one to post (on Facebook), especially not about my personal life, but I will be making a series of posts leading up to these events. Please join the events below and like or share these posts if you would like to support awareness for this important issue. Feel free to invite friends as well. Even if you don’t donate, you can help just by talking about it. Because not talking about it isn’t working. From March 4th through March 9th, Lakehead University (LU) students will be raising money for the Collateral Damage Project. The goal is to raise $8000 or $1 per student at LU. We will be looking for donations on campus and at local businesses. We are currently planning different events around campus during the week, culminating with a benefit concert by Craig Cardiff on Saturday March 9th at the Finlandia Club. Will you give a dollar to help save a life? Join us at Hillcrest Park in Thunder Bay at 12:00 noon on March 2nd for a Harlem Shake. Bring your wildest costumes and get ready to follow Matt Quirion as he leads out the Harlem Shake. Craig Cardiff performs live at the newly renovated Finlandia Hall, above the famous Hoito Restaurant in Thunder Bay Ontario! This entry was posted in Blog, Guest Blog, News by Scott Chisholm. Bookmark the permalink.